Royal Caribbean's Oasis class ships offer so many amazing dining opportunities, with the premier experience being 150 Central Park. 150 Central Park is the creation of James Beard Award-winning chef Michael Schwartz of Michael's Genuine Food & Drink in Miami. Chef Schwartz created 150 Central Park with a commitment to sustainable and seasonal food sourcing that offers the freshest, most distinct ingredients. Whether you dine on Oasis of the Seas, Allure of the Seas or Harmony of the Seas, here are five things that are sure to please at 150 Central Park. Any good chef knows that presentation is as important to a meal as the food itself, and 150 Central Park follows that rule with its picture-perfect home in the Central Park neighborhood. Set among the beautiful layout of Central Park, guests will walk past towering Cuban laurel and Black Olive to clusters of calla lilies and rabbit foot ferns to get to the restaurant. With dinner in the evening, it is an undeniably beautiful backdrop for dinner. A meal at 150 Central Park is more than just great food. It is about every aspect of the meal, from when you set foot in the restaurant to when you leave. Royal Caribbean designed 150 Central Park to offer guests an intimate dining experience that is unlike anything else offered onboard. That means not only dressing up for the occasion, but a wait staff trained to make your meal as personal as possible. Your waiter will explain each menu choice for you and customize the experience to meet what you want. 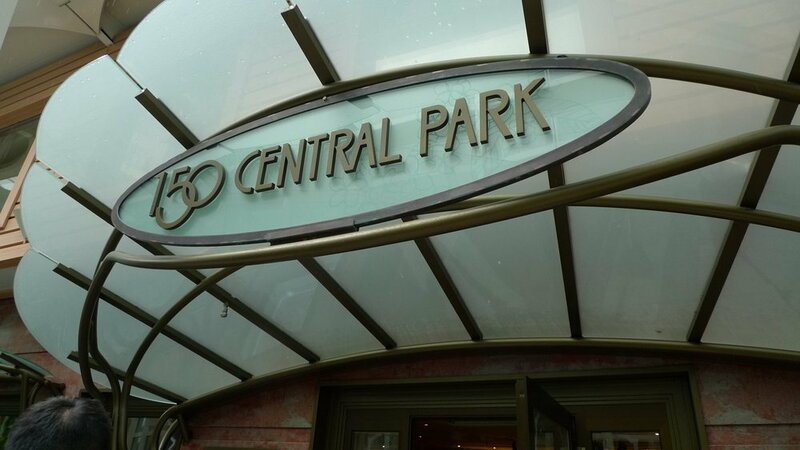 For guests seeking a chic night out, 150 Central Park is the place to go. Chef Michael Schwartz offers guests at 150 Central Park an innovative dining concept with 150 Central Park. The menu is seasonal, which means it is regularly changed to offer the freshest and most distinct ingredients. The 150 Central Park menu features rotating six-course menus per voyage highlighting fresh produce from small Florida farms. No matter when you dine at 150 Central Park, you are sure to find responsibly- and locally-sourced ingredients that are in season. When you talk about any kind of upscale dining experience, wine pairings with your meal are common place, including at 150 Central Park. Royal Caribbean offers guests the choice of reserving a meal at 150 Central Park with or without a wine pairing, or simply choosing select wines to enjoy with their meals. At $75 per guest, the wine pairing option includes a glass of wine to match each serving during the course of the meal. The wine accompaniment is chosen to compliment the evening's menu and serves to enhance the flavor of the food. Wine lovers will consider this option a must-do. In addition to the great food served at 150 Central Park, the restaurant features a signature cocktail that is a must-try: the cucumber martini. As the name implies, there is a hint of cucumber to a classic martini concoction that is light and very refreshing. This drink is a mix of cucumber, basil,Monin lemon grass syrup, sweet and sour mix and Grey Goose Vodka. Many Royal Caribbean fans claim this is among the very best cocktails Royal Caribbean offers, so give it a try!